Secretary(Textiles),Mr.Anant Kumar Singh, in the capital city of Delhi to apprise its shareholders about the scheme and its guidelines. The stakeholders concerned, were encouraged to give their feedback while also addressing their concerns,vis-a-vis to the implementation of the SAMARTH scheme. The guidelines of the scheme got released on 23rd April,2018 so as to facilitate its stakeholders in addressing their issues related to its workings at the ground level. What the Scheme Is all about? Well, SAMARTH- Scheme for capacity building in Textile Sector, got launched by the Ministry of Textiles for the training and employability of the youth in the booming textile sector of India. It has been envisaged to provide skill development training to around 10 lakh youth(9 lakh in the organised and 1 lakh in the traditional textile sector)over a period of 3 years(2017-2020) with an outlay of 1300 crore Rupees, so as to achieve the governments vision of increasing India’s textile export to 300 billion USD by 2025. This scheme was approved by the CCEA on 20th December,2017 and got launched under the leadership of Shree Narendra Modi. A sum of 1300 Crore Rupees have been allotted for it. Ministry of Textiles is the Nodal Agency. Training courses to be compliant with the National Skill Qualification Framework(NSQF). To use Biometric identification process for the selection of the candidates for the training purposes,thus AADHAAR is mandatorily required. To provide real time attendance system to be integrated with the centralized Management Information System(MIS). It covers the entire value chain of textiles,except the spinning and weaving industry. To achieve the Government Of India’s target of increasing India’s export target of 300 billion USD by the year 2025. To ensure 70% placement, on the successful completion of the scheme in the textile and allied sectors. Training to be funded by the Ministry of Skill Development and Entrepreneurship(MSDE). RSE-Resource Support Agency, has been entrusted with the development of the course content, specifying the training centres infrastructural requirements, standardizing the admission assessment certification and accreditation processes. Textile committee also needs to train and conduct regular assessment tests for their trainers. The NSQF is required at the National Skill Development Agency (NSDA) and is being brought into force through the National Skills Qualifications Committee (NSQC) which comprises of all the concerned stakeholders. The NSQF is a mechanism which rates the skills,aptitude and the level of knowledge possessed by an individual, on a scale of 1 to 10,and are expressed in terms of the learning outcomes which a learner must have, in order to successfully complete the course and acquire the necessary competencies in the area of his interest or work. In India it was notified in the year 2013,following suit the major developed or developing countries. 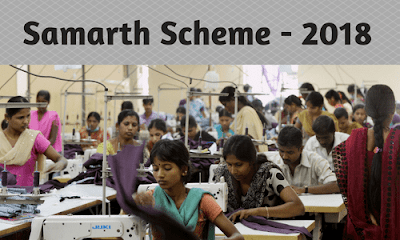 It has to be seen how successfully, SAMARTH Scheme gets implemented, in the near future and, to what extent it is able to achieve its targets as envisioned by the Government of India and the Ministry of Textiles.